The Springfield Riding Club is a great place for horseback riding lessons! We have several instructors for all ages across all disciplines. Whatever your direction, we can connect you with a professional to help you move forward. We do have finished horses for improving your riding, or we can work with you and your horse. Outside instructors are also welcome to use the facility for education and training. All professionals need to provide a copy of their insurance prior to establishing a facility use agreement. Download "SGF Riding Club Lesson Program.pdf"
The Springfield Pony Club is a 501(c ) 3 non-profit youth development program teaching so much more than just horses. The opportunities to learn about horses, become better riders, and make friends along the way are vast. With Pony Club, you do not need to have a horse to join, and opportunities go from local achievement all the way to international competition. This is a great way for young families to get started with horses. Pony Club meets monthly, the third Tuesday of every month. Dinner is provided at 6:30, and educational talk starts at 7pm with club business to follow. Meetings will conclude by 8:30. The EasyRiders is a competitive performance team that uses the horse to teach life lessons such as achievement, teamwork and leadership. Focuses on developing valuable life skills for already riding youths through a level based training program and travelling performances. The EasyRiders are a nationally ranked mounted drill team which uses intensive training to accelerate the learning curve of young riders. This local team is the source of many of the area’s mounted drill troupes. 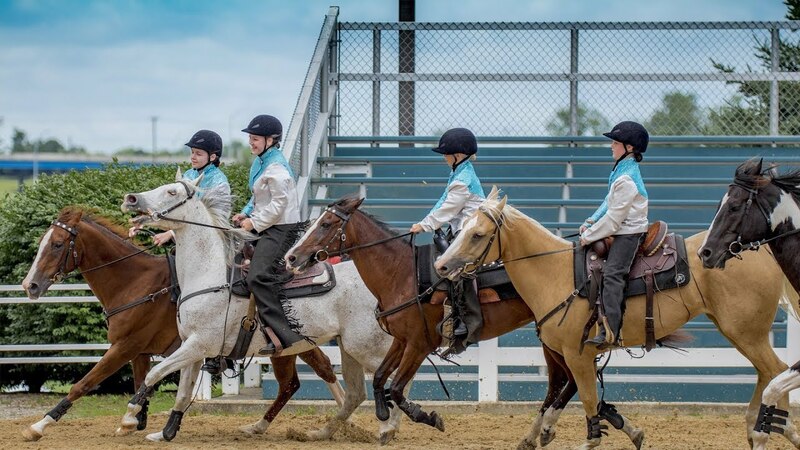 Drill team is one of the few “team sports” that riders can participate in. In addition to horsemanship, riders learn in a team setting and make life long friends along the way. Specifically, riders who finish the program are capable of performing individually with their horse without the use of special training aids: haunches and forehand pivots, sidepassing, leg yielding at all gaits, proper canter departures and both simple and flying lead changes. With the team, they are capable of managing their horse through a myriad of movements among other fast moving horses among other distractions of loud music, spectators, etc. The Springfield Riding Club looks forward to being the home of many educational programs. Stay tuned for upcoming programming. Look up all our events on the Events Calendar page.